SAN DIEGO, CA – May 24, 2018 – Founders of the GI Film Festival (GIFF), the nation’s premier entertainment enterprise exclusively dedicated to presenting the veteran experience through film, television and special events, announced that San Diego will be the home of the national film festival for 2018. The announcement was made at an exclusive press event at the National Press Club this morning. Moving forward, the GI Film Festival San Diego will present the full festival lineup of screenings and events, including awards, premieres and panel discussions. In addition, KPBS, San Diego’s public media station, in partnership with PBS Stories of Service will offer expertise and templates for PBS stations around the country to replicate the festival in their own markets. The goal is to expand the footprint of the GI Film Festival across the country. Today’s press event featured a “Bridging the Military-Civilian Divide Through Film and Television” panel discussion with Wendell Pierce, star of the new “Jack Ryan” series on Amazon, PBS President and CEO Paula Kerger, and GI Film Festival Co-Founder and GI Film Group CEO Brandon Millet. GIFF will host additional special events later today to commemorate the expansion announcement, including an advanced screening of the upcoming PBS documentary GOING TO WAR, featuring journalist and best-selling author Sebastian Junger and producer Michael Epstein. Yesterday GI Film Festival held a Congressional Reception featuring special guest actor and GI Film Festival supporter Gary Sinise. The shift to the West Coast is a natural one for the national GI Film Festival, which launched in Washington, DC in 2007. 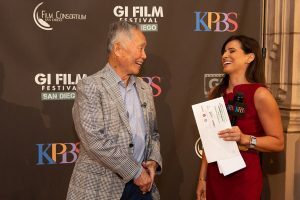 Over its 12-year history, the GI Film Festival has received more than 3,000 film submissions and helped usher 400 military-themed films into the marketplace through its events becoming “the go-to place for military-themed movies,” according to actor and renowned military philanthropist Gary Sinise. The festival expanded to San Diego in 2015. San Diego boasts one of the largest military populations in the U.S., with seven major military bases between the Navy, Marines and the Coast Guard. San Diego County has the third largest veteran population in the U.S. with more than 240,000 veterans and more than 100,000 active duty members. GI Film Festival San Diego will be the place to come and see military films featuring stories for, by, and about military service members and veterans from across the United States and around the world. The festival’s Local Film Showcase is curated by Film Consortium San Diego and features films with local connections. Film types range from narrative and documentary features and shorts, submitted by professional teams, independent filmmakers, and students. The opening night screening and celebration will take place on Tuesday, Sept. 25 at the Museum of Photographic Arts in San Diego. Festivities continue through Friday, Sept. 28 at the museum located within iconic Balboa Park. The festival moves to UltraStar Cinemas at Hazard Center for the Saturday, Sept. 29 and Sunday, Sept. 30 screenings. Many of the events are open to the public with discounted opportunities for active duty personnel and veterans. A complete schedule of film titles will be announced in July 2018. Additional information is available at www.GIFilmFestivalSD.org. All films are eligible for the annual “Best of the Fest” awards to be held on Saturday, Sept. 29 at the DoubleTree by Hilton Hotel San Diego in Mission Valley. Local Film Showcase submissions will also be eligible for awards specific to the San Diego area film community. Prior to the official festival opening on Sept. 25, organizers invite the public to the festival’s Family Movie Night to be held on Friday, Aug.24 aboard the USS Midway Museum in San Diego Harbor. Filmmakers of every experience level from first-timers to veteran directors and producers have just a few more days to submit their films, provided they meet the requirements. All submissions for the GI Film Festival San Diego’s Local Film Showcase will be accepted until May 31, 2018. Click here for more information and instructions on how to submit films for 2018 contention. Established in 2015, the GI Film Festival San Diego aims to reveal the struggles, triumphs, and experiences of service members and veterans through compelling and authentic storytelling. Documentaries, shorts, narratives, and family-friendly films are presented, highlighting stories of heroism, resilience, and honor. The festival includes the Local Film Showcase, which features San Diego’s filmmakers, events, people, or places. Post-screening discussions with filmmakers, actors and documentary subjects are also part of the festival as well as a family movie night which brings military-connected and civilian families together for an evening of movie magic and community spirit. The festival is organized by KPBS in partnership with the GI Film Group and Film Consortium San Diego. Official sponsors of the 2018 GI Film Festival San Diego include: Kaminskiy Design & Remodeling, The Super Dentists, TriWest Healthcare Alliance, Altus Schools, and Bob Baker Subaru with additional support from Scatena Daniels Communications. The GI Film Festival San Diego is a proud member of the San Diego Veterans Coalition.